The first attempt at permanent settlement at Ferryland began in 1620 when George Calvert, later the first Lord Baltimore, purchased a narrow tract of land between Capelin Bay (now Calvert) and the headland between Aquaforte and Fermeuse on the southern Avalon Peninsula. In 1620, George Calvert purchased a parcel of land along the southern coast of Newfoundland. It was here that Calvert succeeded in establishing one of the earliest permanent English settlements in the New World. From Justin Winsor, ed., Narrative and Critical History of America: English Explorations and Settlements in North America 1497-1689, Vol. III (Boston: Houghton, Mifflin & Company, 1884) 518. He purchased the land from Sir William Vaughan, whose efforts to start a settlement there in 1617 and 1618 did not succeed. Calvert, who had a longstanding interest in New World settlement, determined to establish a colony there to take advantage of the rich fishery. Perhaps foreshadowing the later religious aspects of his settlement, Calvert chose the name "Avalon" for his colony, after Avalon in Somerset, England, which has associations with early Christianity. 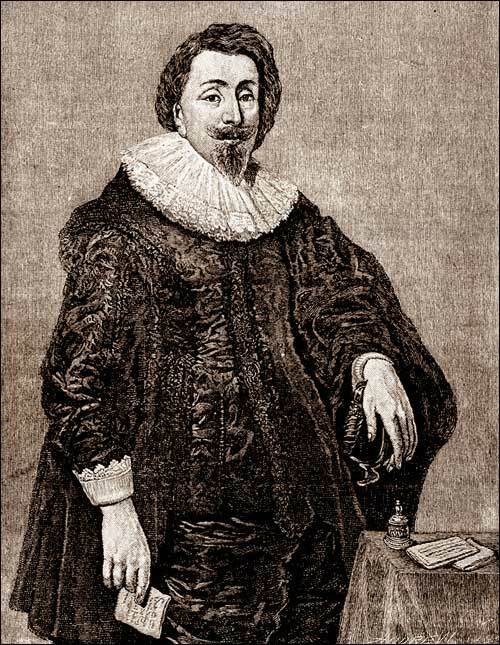 Sir George Calvert, the first Lord Baltimore, had a longstanding interest in New World settlement. From Justin Winsor, ed., Narrative and Critical History of America: English Explorations and Settlements in North America 1497-1689, Vol. III (Boston: Houghton, Mifflin & Company, 1884) 520. In August 1621 the first settlers, twelve in all, arrived at Avalon under the direction of the colony's first governor, Captain Edward Wynne. Wynne's letters to Calvert in the early years of the settlement provide descriptions of the settlers' efforts to erect a permanent settlement. Before November 1, 1621, a house (the "mansion house")1 of 4.5 x 13.3 metres (14.8 x 43.6 feet) had been constructed, and by the following summer additional structures, including a kitchen room and parlor adjacent to the mansion house, of 4.5 x 13.3 metres (14.8 X 43.6 feet) had been constructed, and by the following summer additional structures, 2 including a kitchen room and parlor adjacent to the mansion house, tenements, a brew house, henhouse, saltworks, forge and defensive palisade had been added to the growing settlement. The following winter (1622-23) some 32 colonists were permanent residents of Avalon, including the first women and children. By the middle of the decade the population numbered about 100 permanent residents and an undetermined but probably greater number of seasonal fishermen. Calvert himself, now a professed Roman Catholic and therefore retired as secretary of state to James I, visited Avalon in 1627 to inspect his New World venture. The cross is made of iron and some yellow metal with traces of gold gilt work. There are areas of the cross that appear to be where gems may have been. 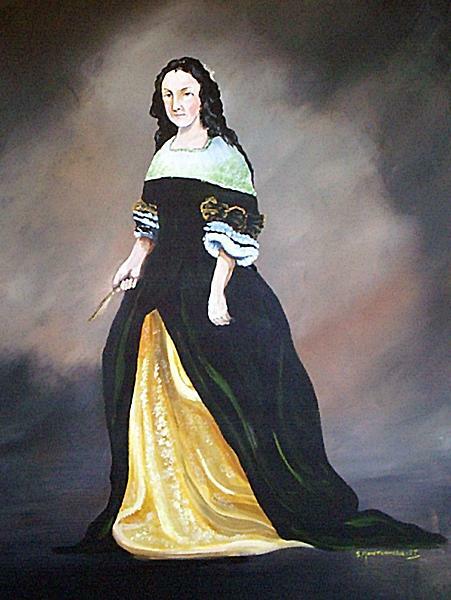 It was found in Ferryland in association with George Calvert's settlement. 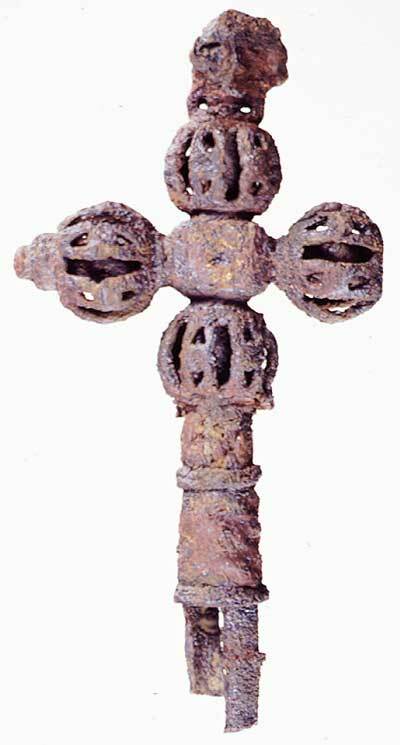 Experts have been unable to positively identify if the cross was used in the Roman Catholic or Anglican church. Reproduced by permission J. A. Tuck, Memorial University of Newfoundland, St. John's, NL. At about this time he brought additional settlers, most of the Roman Catholic faith, as a result of which Avalon began to acquire its reputation as a haven for Roman Catholics fleeing English penal laws. How great a part religion played in Calvert's settlement of Avalon remains uncertain, but it is without doubt that Avalon was the first religion-tolerant colony in British North America. Calvert must have been pleased with what he saw at Avalon, for he returned with most of his family in 1628 with the intention of remaining there permanently. In 1628, George Calvert returned to Avalon with his second wife, Joan, and most of their family. Since he had intended to remain at the colony, he brought with him some 40 family members and servants. The ensuing winter disappointed him greatly. In an August 1629 letter to King Charles I, Calvert stated that it had been much harsher than he had expected.3 He had determined to leave Avalon and establish a settlement further south in Virginia, where he obtained a grant of land. However, he died in 1632, two years before his heirs founded St. Mary's City, the first settlement in what is now the State of Maryland. The Calverts did not abandon Avalon altogether, for they left a representative at Ferryland, and continued to press for ownership of the colony throughout much of the 17th century. 1. Wynne, Edward. 'Edward Wynne; 28 July, 1622: Letter to George Calvert [from Ferryland]. Published in Richard Whitbourne, A Discourse and Discovery of New-found-land (London: 1622). Reprinted in Gillian Cell, ed., Newfoundland Discovered, English Attempts at Colonization, 1610-1630, Hakluyt Society 2nd series no. 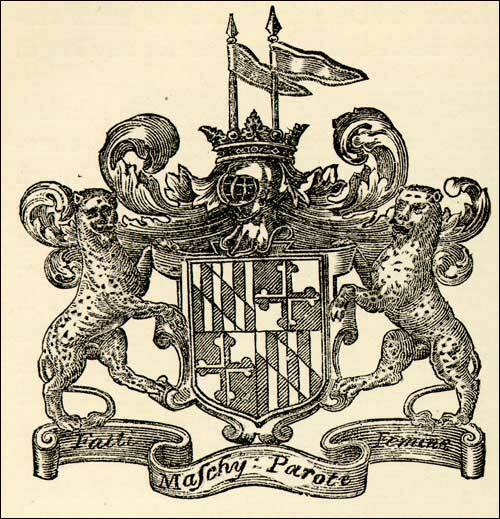 160 (London: Hakluyt Society, ©1982) 101-206; see 195-198. Revised by P.E. Pope. 2. Wynne, Edward. 'Edward Wynne; 28 July, 1622: Letter to George Calvert [from Ferryland]. Published in Richard Whitbourne, A Discourse and Discovery of New-found-land (London: 1622). Reprinted in Gillian Cell, ed., Newfoundland Discovered, English Attempts at Colonization, 1610-1630, Hakluyt Society 2nd series no. 160 (London: Hakluyt Society, ©1982) 101-206; see 195-198. Revised by P.E. Pope. 3. Calvert, George. 'Sir George Calvert, Lord Baltimore; 19 August, 1629: Letter to King Charles I.' Great Britain, PRO, Colonial Office, CO 1/5 (27), 75. MHA 16-B-2-011. Transcribed by P.E. Pope.